The front fork is the movable part of the frame that holds the front wheel. The wheels - The wheels are made of a hub, the spokes, the metal rim & the rubber tire. That's all there is to a bicycle! The ball bearings (yellow) ride in a cup (red). The cones (dark blue) screw onto the light blue tube that is attached to the fork. The cones are adjusted to be tight enough that there is no play in the fork, but not so tight that they squeeze the ball bearings & cause them to bind. 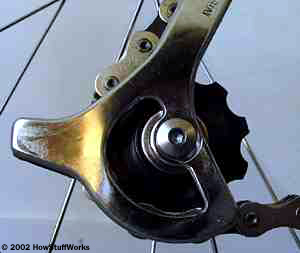 The wheel hubs & pedals work exactly the same way, w/the cones providing the adjustment. In the crank axle, one of the cups provides the adjustment instead of the cones. A little bit of grease in the bearings makes them even smoother. Periodically, you have to disassemble the bearings on a bicycle to clean out the dirt & put in fresh grease. Some more expensive bicycles have sealed bearing cartridges that never need adjustment or lubrication. The idea behind multiple gears on a bicycle, whether it's an older "10-speed" bike or a modern mountain bike w/24 gears, is to let you change the distance that the bike moves forward w/each pedal stroke. 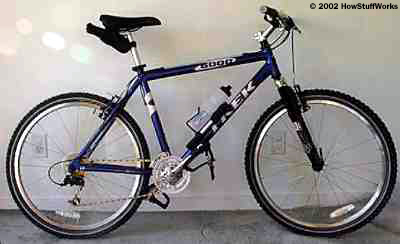 e.g., a normal bicycle has wheels that are 26" in diameter. 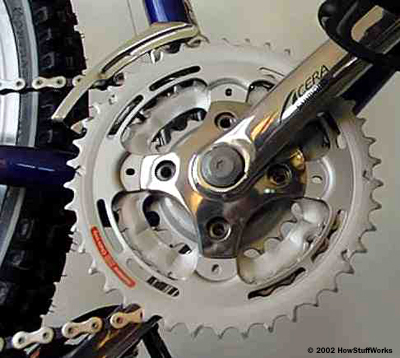 The "lowest" gear ratio on the bike might be a front chain wheel w/22 teeth & a rear gear having 30 teeth. That means that the gear ratio is 0.73-to-1. For each pedal stroke, the rear wheel turns 0.73 times. In other words, for each pedal stroke, the bike moves forward about 60" (about 3.4 mph / 5.4 kph at a 60-rpm pedaling rate). 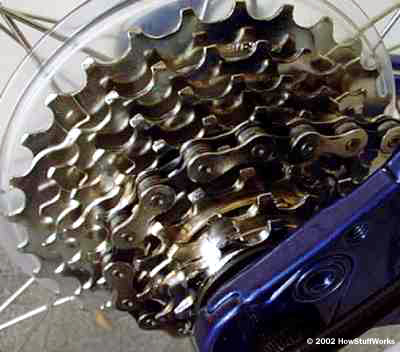 The "highest" gear ratio on the bike might be a front chain wheel w/44 teeth & rear gear having 11 teeth. That creates a 4 to 1 gear ratio. With 26" wheels, the bike moves forward 326" w/each pedal stroke. At a 60-rpm pedaling rate, the speed of the bike is 18.5 mph (30 kph). By doubling the pedaling rate to 120 rpm, the bike has a maximum speed of 37 mph (60 kph). A range of 3.4 mph to 37 mph is fantastic & it lets the rider climb the steepest hill very slowly or race almost as fast as a car! That is why a bike has gears. The freewheel has between 5 & 9 gears on it, depending on the bike. A freewheel spins freely in one direction & locks in the other. That allows the rider to either pedal or not pedal, when not pedaling, the bike coasts (another feature that tricycles & penny-farthing bicycles lack). 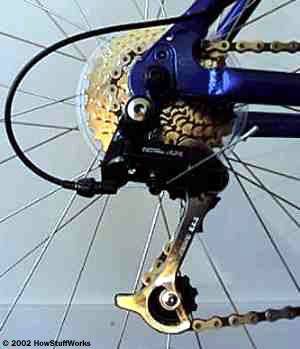 The rear derailleur has 2 small cogs on it that both spin freely. 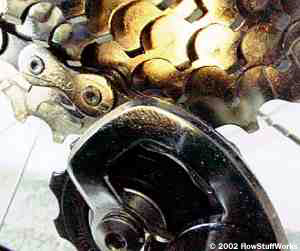 The purpose of the arm & lower cog of the derailleur is to tension the chain. The top cog is very close to the freewheel. When you adjust the gears w/the lever on the handlebar, this cog moves to a different position on the freewheel & drags the chain w/it. The chain naturally slips from one gear to the next as you turn the pedals. Everything about a bicycle is simple. That's what makes it such a great machine to ride & also a great mechanical work of art! The concept behind a bearing is very simple: Things roll better than they slide. The wheels on your car are like big bearings. If you had something like skis instead of wheels, your car would be a lot more difficult to push down the road. That is because when things slide, the friction between them causes a force that tends to slow them down. But if the two surfaces can roll over each other, the friction is greatly reduced. There are many types of bearings, each used for different purposes. These include ball bearings, roller bearings, ball thrust bearings, roller thrust bearings & tapered roller thrust bearings. Ball bearings, as shown below, are probably the most common type of bearing. They are found in everything from inline skates to hard drives. These bearings can handle both radial & thrust loads & are usually found in applications where the load is relatively small. In a ball bearing, the load is transmitted from the outer race to the ball & from the ball to the inner race. Since the ball is a sphere, it only contacts the inner & outer race at a very small point, which helps it spin very smoothly. But it also means that there is not very much contact area holding that load, so if the bearing is overloaded, the balls can deform or squish, ruining the bearing. You have probably seen a picture of the funny-looking "penny-farthing" or "high-wheeler" bicycles, the ones w/a huge front wheel & a tiny rear wheel. You might even have seen someone riding one in a parade or in a movie. These bicycles became popular starting in 1870, but by the turn of the century were replaced by the "safety bicycle." A bicycle from 1900 or 1910 looks almost exactly like any bicycle you see today. Today's bicycles have two wheels of the same reasonable size, a pair of pedals in the middle of the bike & then a chain that connects the pedals to the rear wheel. So why did penny-farthing bicycles ever exist? In a penny-farthing bicycle, the pedals & the front wheel are directly connected just like they are on a kid's tricycle. That means that when you turn the pedals one time, the wheel goes around one time. That's an inexpensive way to build a bicycle, but it has a problem. Think about a kid's tricycle. The front wheel might be 16" (40 cm) in diameter, or 16 * 3.14 = 50" (127 cm) in circumference. That means that each time a kid on a tricycle pedals through one revolution of the front wheel, the tricycle moves forward 50" (127 cm). Let's say that the kid is turning the front wheel at 60 rpm, or one revolution per second. That means that the tricycle is moving forward 50" per second. That is only 2.8 miles per hour (4.5 kph). If the kid pedals twice as fast, at 120 rpm, the trike is moving at just over 5 miles per hour (9 kph) & the kid looks like his legs are about to spin off because 120 rpm is a lot of pedaling! If an adult wants to ride a tricycle at a reasonable speed, maybe 15 mph (24 kph) & if the adult does not want his or her legs to fly off, then the tricycle's front wheel has to be pretty big. If the adult wants to pedal at 60 rpm, the front wheel needs to be 84" in diameter. that's 7 feet (more than 2 meters) in diameter! The first thing that causes bicycles to have gears is the fact that gears can reduce the wheel size from 7' in diameter to something reasonable. As described in the article How Gears Work, gears & gear ratios are a good solution to this problem. For example, if you put a gear with 42 teeth on the front chain wheel & a smaller gear w/14 teeth on the rear wheel, you have a 3 to 1 gear ratio. Now the back wheel can be 84" / 3 = 28 inches (71 cm) in diameter, about the size of a normal bicycle wheel. This is a much safer approach. more great resources for learning about bicycles! it's e-mail from you all .... you who visit my sites that keeps me encouraged to work these sites & motivated to continue to update them.... take some time to think about the fact that i began with one website, a few years ago.... depressed, anxious, dissociating regularly.... i found the counselor that could diagnose me with ptsd...... & i realized that my recovery depended on me helping myself thru helping others.... click here to send me an e-mail and say hello!